Travelling to Disney with a small child? It probably feels daunting doesn't it? We took Jacob to the Magic Kingdom to get his first haircut at the Main Street Barbershop and I remember feeling very overwhelmed and very afraid I might forget something super important. I learned a lot that day (and the following day at Animal Kingdom) about what I can and can't do, and what I do and don't need and I've compiled my best advice here for you! 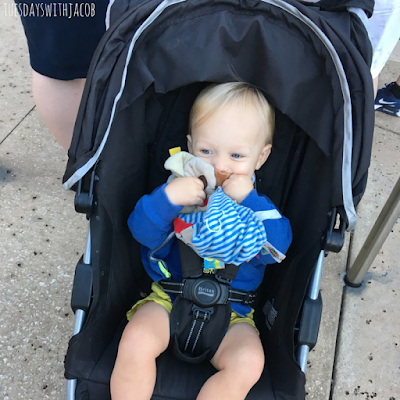 If you'd like to know more about our trip you can read about our day at the Magic Kindgom and our day at Animal Kingdom. 1. Bring snacks. Disney doesn't prohibit you from bringing food or drinks into the parks and this can really save you a lot of money, not to mention meltdowns. There are two exceptions - alcohol, and glass bottles. (glass baby food jars are ok). We brought tons of ziploc baggies filled with goldfish, pretzels, crackers and cereal, plus yogurt and applesauce squeeze pouches. You may still find yourself buying some Disney snacks, but having your own should cut down on purchases. We whipped out our snacks ALL THE TIME in line too. Having something to munch on helped distract Jacob and pass the time waiting. 2. Strollers are a must. If at all possible, bring from home the one you regularly use. If that's not possible, consider a stroller rental company. There are several in the Orlando area who will deliver them right to your hotel for you. Disney's strollers should be seen as your last option. They are hard plastic and your chances of getting your toddler comfortable in there are slim. Even if you have an older toddler who you think will be just fine walking,bring a stroller. Your family is likely to walk several miles over the course of the day and little feet will get tired. Unless carrying your toddler all over the parks is part of your fitness plan - only then can you leave the stroller at home. 3. Pack light. Besides our stroller we brought just two cinch top backpacks (as seen in the picture at the top of this page) One was filled with the snacks I mentioned earlier, two water bottles, sunglasses, sunscreen, and a sippy cup. The other was filled with a change of clothes, several diapers (add two extra on to how many you think you'll need for the day) a small travel pack of wipes, small wallet, our camera and our phones. Don't bring lots of unnecessary stuff that you'll have to carry around the park. When you get on rides you have to park your stroller and leave it outside the line queues so you won't want to leave anything important in there either. 4. Check the weather. I'm stating the obvious, but Florida is hot most of the year. (same for California!) The sun is harsh and the humidity can be brutal. Hats and sunglasses are your best bet for keeping your child covered up. And don't forget to apply sunscreen before heading out to the parks. If rain is in the forecast, pack those rain ponchos that fold down really small and light. They are only a few dollars - unless you buy them in the parks. If you wait to see if it will actually rain, and it does, you will spend way more than necessary purchasing ponchos in the park. They don't take up much space so it's much better to bring them just in case if there's a chance of rain. 4. Share meals. We learned this the hard way at the end of the day when we realized how much we'd spent on food. 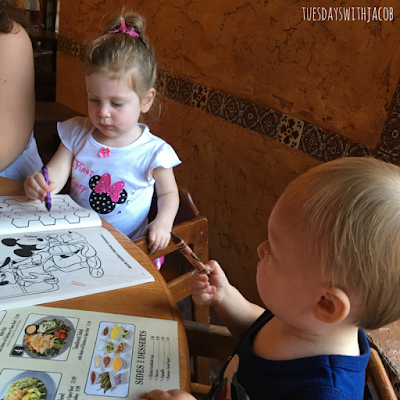 Kids meals are expensive and your toddler likely doesn't need their own. Most kids are more than happy to eat off Mom and Dad's plates. If we're being really honest, with all the snacks we brought, we probably would have been fine sharing one meal for the three of us at both lunch and dinner. When we return to the parks in March, we're definitely going to aim to share. Sharing is no problem at counter service restaurants, though it might not go over as well at table service restaurants. It definitely won't fly at buffets or character meals. 5. Forget the souvenirs. If you want to buy Disney themed paraphernalia, buy it ahead of time at any Orlando convenience store. You're paying a huge up charge if you purchase at the parks. You could set it out the night before along with a note from a Disney character saying how excited they are that your child is coming to visit them. That way, if your kids are begging for items at the park, you can remind them of the gifts that the characters already brought them back at the hotel. We've made an exception to this only once. We knew Jacob was going to be Donald Duck for Halloween and I was dead set on getting him a Donald Duck plush toy. We planned for this expense ahead of time, so that when we went into the stores we weren't tempted to purchase anything else. Disney LOVES to try to get you on those impulse buys. 6. Get in a nap. If your toddler will nap in your stroller, you're golden. This is why bringing your own is so important. Even better if you are staying on Disney property and can head back to the hotel for a nap and then return after. 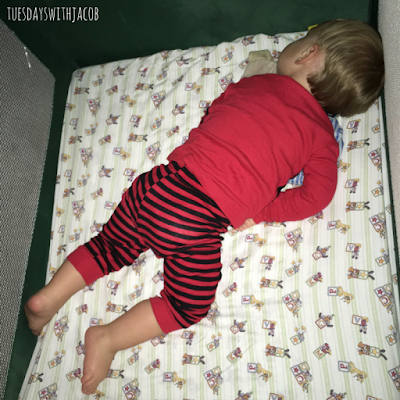 Toddler naps are often during the hottest part of the day, so it's the perfect time to head back for some rest and stay out of the heat. Keeping your child on their normal napping schedule will bring some normalcy to an otherwise very out of the ordinary day. If you plan to stay late at the parks, past your child's bedtime, for Wishes Fireworks or the Main Street Electrical Parade, don't skip nap. Your child will either be so over tired that they'll be in meltdown mode, or they will fall asleep and miss all of it. Our first day at the Magic Kingdom we returned to our hotel for a nap, the second day at the Animal Kingdom we had already checked out of our hotel so Jacob napped in his stroller. 7. Plan Distractions. Waiting is synonymous with theme parks. Whether you are waiting for food at mealtime, waiting in line for a ride or character meet and greet, or even just waiting for transportation to leave, you are going to spend quite a bit of time waiting. Plan to entertain your child during these times. I already mentioned snacks, but if your child isn't hungry that may not work. Coloring books and small packs of crayons don't take up much space and are great for waiting at restaurants. If you aren't against toddlers using technology, load some of their favorite shows or games onto your phones. You might even consider bringing a small list of easy games you can play such as I-spy, simon says, etc. Jacob is totally into letter flashcards (his are on a ring that he can flip through and repeat after us as we say the letters) so those will probably come with us in the future. 8. Don't plan to do everything. If you are going to Disney with a toddler, you aren't going to be able to hit every ride. Just accept this and don't make yourself crazy attempting to cover it all. Plan to go at a much slower pace than you did pre-kids and follow your child's lead. We only did about a third of the rides when we took Jacob. If you go in with really high expectations that you are going to see everything and go on every ride you are going to end up disappointed, and ruin your fun trying to fit it all in. This was a REALLY hard mental switch for me to make. I'm very type A and like to plan out our day to fit in as much as possible. I knew ahead of time that I was going to have to let that go and let Jacob run the day. When he was getting tired and cranky right before our fast pass for Kilimanjaro Safaris at Animal Kingdom, we skipped it and let him nap while we walked through some of the animal viewing nature trails. 9. Know your kids. Do they like speed? Are they afraid of the dark? Avoid rides that you know will upset your child. If they don't normally like it, they aren't going to magically like it at Disney either. 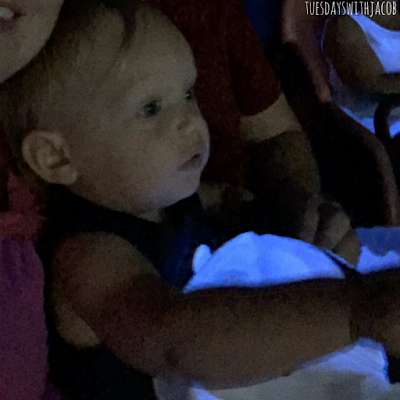 We took Jacob on the Voyage of the Little Mermaid as our very first ride. The wait was short and it was a new ride since we had last been before he was born so we were excited to try it out. You sit in a clam shell that moves very slowly along a belt so we thought we were fine. Turns out your clam shell is going to visit Ursula's lair and it is VERY dark in there. Our toddler was crying on his very first ride. Not the start to the day we had hoped for. Moral of the story - if you don't know what a ride is like, ASK. The cast members are very helpful. That being said, don't be afraid to try something new either. We were a little worried that the Dumbo and Magic Carpet rides might be a bit to fast for Jacob, but we tried them anyways since we weren't sure. I'll be darned if that boy didn't laugh and squeal with delight the whole time. Approach character interactions with caution. If your child isn't into the characters ( or is down right afraid as many toddlers are) don't push it. For this reason I feel it's best to wait on reserving character meals until you're sure of how your child will respond. They are very expensive and you're really only paying extra to see the characters while you eat. 10. Use Fast Passes. Fast passes get loaded onto your phone and allow you to skip the regular line. Only so many are handed out for each ride for each time slot, so you don't end up waiting long, if at all. Plan your first three fast passes for as early in the day as possible. Once you've used your first three you can find a kiosk at the park and load three more onto your account. You can't load more until the first three are all used up (or cancelled) though. So don't plan two in the morning and one in the evening thinking that you'll be able to load two more after using the first two. All three have to be gone. If you miss one or know you aren't going to use it then you can use the kiosks to cancel or reschedule. 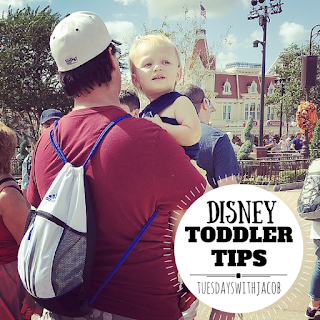 Do you have any Disney Toddler Tips? I'd love to hear them for our next trip! Leave me a note below.